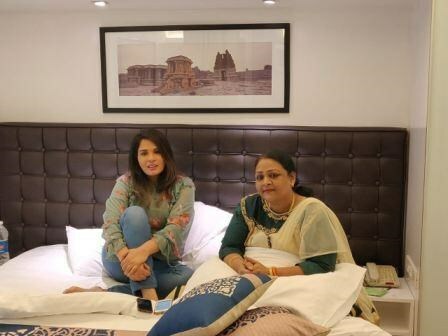 #RichaChadha meets the real #Shakeela as prep for the biopic on the actress’ life! Richa is all geared up to play the role of a popular adult film star from the south Shakeela. Best known for her adult films, Shakeela became a rage overnight after her first mainstream film Playgirls in which she acted alongside Silk Smitha. One of the most popular names in the south even today, Shakeela has a story that makes for a compelling celluloid tale for the audience to watch. She rose to stardom after Silk Smitha, grabbing every producer and director’s attention in the Southern film industries also becoming the first female actor in Malayalam cinema to gain such popularity back when it was a largely male-dominated business. Richa, who is known for doing experimental roles and roles which are defying, was the ultimate choice for the filmmakers of the Shakeela Khan biopic to play the titular role. She recently met Shakeela in Bangalore for the first time for an official meet and greet session. Both the real and reel Shakeela spent a great deal of time together and had a great time bonding understanding each other.